Dahab is nestling between the golden mountains of the Sinai desert and the vibrant Red Sea reefs. It is located about 90 km north of Sharm el Sheikh on the Gulf of Aqaba, which reaches a depth of almost 2000 m. This pearl of the Gulf actually consists of two villages; the Bedouin village of Assalah is the southern half, with the business and administrative centre of Dahab to the north. The Bedouins in the Dahab area are called Muzeina. In the past they had a self-sustaining lifestyle which was based on fishing and traditional goat herds. Today they give Dahab much of its unique, relaxed atmosphere. The Bedouins are proud people with a strong sense of identity, having preserved their sense of community and their excellent hospitality. It is extremely important to the Bedouins to maintain their original traditions and ways of life. The former Bedouin fishing village of Dahab with its idyllic setting is nowadays a popular destination for adventure enthusiasts and those looking for a mellow place to relax in hippie-style in year-round sun. The combination of sea and desert makes Dahab a perfect place for windsurfing, scuba diving, free-diving, rock climbing and of course desert trekking with the Bedouin, whether by jeep or camel. Dahab and its natural wonders welcome everyone. It’s a place for everyone with an open mind and heart. The most traditional thing to do in Dahab is not to do anything. It’s one of the best places in the world to indulge this most exquisite passion. Anyway, if doing something to you means activity or sites, Dahab offers a great variety of options. The diving sport is extremely popular in Dahab. There are more than 60 diving centres. The reefs are still in relatively good shape and excellent shape in the Protected Areas like Ras Abu Galum. Most reefs in Dahab are shore dives, making diving simple – you just walk into the sea from the beach, keeping Dahab’s waters free from exhaust and noise pollution from dive boats. Known dive sites include Abu Helal, Blue Hole, The Bells, Canyon, Coral Garden, Eel Garden, Lighthouse, Moray Garden, Islands, Three Pools, Gabr el Bint, Ras Abu Galum. Dahab tends to attract three different diving characters: technical divers and free divers in search of the really deep blue, particularly at sites of the Blue Hole and the Canyon. The remaining crowd is generally recreational divers attracted by hassle-free shore diving in calm waters. The variety of dive sites can usually be dived at any time of the day depending on wind conditions. Dahab’s most infamous dive site is the Blue Hole, which is 107 m deep with an arch opening onto the reef face at 58 m. This site is considered to be the most dangerous scuba diving site on earth. Should you be interested in descending to the arch you MUST go through technical dive training and visit the Blue Hole on the correct gases. Diving this site on air alone is near suicidal. So, even if a very experienced person offers to take you through, do not at any price do this unless you have technical training and are using it. There are many beautiful snorkelling sites at Dahab with for example table corals and impressive fish life. To mention some of them: the reef of Assalah, the reef of Mashraba, Lighthouse Reef and the popular Eel Garden, where a colony of eels lives on the sandy sea bed. Also the top of the reefs of dive sites as the Canyon and Blue Hole are teeming with life and are fine snorkelling destinations when the sea is calm. It’s easy to find half-day tours to both sites. Many dive centres also organise snorkelling safaris to the nearby Ras Abu Galum and Nabq. You can hire snorkelling gear from the dive centres. Keep in mind that some of the reefs have unexpected currents, so keep your wits about you. Dahab has about 300 days wind a year. The centre of the bay boasts the steadiest winds, though strong gusts occasionally sweep across the northern end. There are possibilities for beginners as well as highly trained windsurfers. There are several wind surfing schools around Laguna area offering all levels of courses. Experts with their own equipment can also surf from Masbat Bay, but must take great care not to hit the snorkellers and free divers on Lighthouse Reef. Kite surfing can be done on different spots, among them the stunning location of the Laguna at Ras Abu Galum. Whoever is curious to see what the underwater world has to offer, but does not have the courage to jump in the sea, there are glass boats which makes it possible to see the corals and fishes through the glass bottom. Sinai is really a beautiful desert. Trips to the desert can be great adventures and full of surprises. The desert is the home of several Bedouin tribes and clans. The nomadic Bedouins with their camels, sheep, goats and donkeys succeeded for centuries to live in harmony with desert’ nature. Their habits and customs hardly changed till today. On most of the trips you get the chance to visit a Bedouin tribe. A visit to a Bedouin settlement is a learning experience. Sip their Bedouin herbal tea. Learn how they brew coffee over an open fire and bake bread in hot ashes in the sand. See the sun set and a crescent moon appear in the clear desert sky. Have a Bedouin barbeque dinner, sing traditional songs around the campfire and circle dance under a black velvet heaven with a millions of glittering stars in it, before you go to sleep and experience the silence of the desert. Hospitality and friendship are the fundament of the Bedouins tradition. The Sinai Desert has excellent rock climbing possibilities in the granite mountains and wadis, but only from October-April (i.e. not the hot summer months). The climbing is in 2 main areas: Wadi Gnai (close to Dahab) for sports, bouldering and trad, and St Catherine (2 hours away), with strictly trad (absolutely no bolting allowed) and yet more boulders. The Wadi Gnai area has vast amounts of perfect bouldering on granite boulders in shaded, sand-floored valleys. There are single and multi-pitch equipped sport routes for all levels of climbers in Waterfalls, Camel Canyon and Wadi Connection. Especially for beginners and children there is a top roping area in Middle Gnai. Rocks consist of mostly hard sandstone or granite in various colours. If you’re a group, it is great fun to head deep into the desert by camel where you will find unclimbed lines almost everywhere you look! Please respect the holy mountains of Mt. Sinai and St. Catherine by walking the traditional pilgrimage paths rather than climbing. Sand boarding is said to be originated in Egypt in the time of the Pharaohs where they slid down dunes on pieces of wood. It’s possible to book full day and half day sand boarding trips in Sinai at for example Safra Sand Dune, using professional equipment. For those who like hiking, the Sinai desert offers spectacular scenery: wind-sculpted canyons, fractured mountains and giant sand dunes. Enjoy the sunset from one of them, before sleeping in the open air with a million of stars to guide you through the night. The hikes can vary depending on your interests and the weather: visiting a Bedouin village, learn the ancient art of coal fire bread making, learn more about plants and medicines, etc. If you want to go horse riding along the sea-side at sunset or any other time of the day, just wait on the beach in Mashraba for one of the Bedouin who walk up and down with horses for hire. It’s also possible to arrange organised horse-riding excursions for a few hours to Blue Hole, Blue Lagoon, Wadi el Bida or Wadi Gnai. Ever fancied a desert safari on a quad bike? It looks fun when you watch a group race off across the desert, leaving a trail of dust behind them. However, it’s much better to be part of it. But, before you go, shed all your best clothes and anything that might be endangered on a bumpy and very dusty ride. Consider using sunglasses and a head scarf which helps to protect your face from the sun and dust. Ready to go of? Have real fun in the nearby mountains with a quad bike tour to Wadi Gnai or Wadi Connection. Yoga, Qi Gong, energy healing, massage, meditation and more, Dahab’s community has definitely got the alternative lifestyle covered. The quietness and the special energy of the Sinai are truly inspiring for these activities. There are daily yoga drop-in classes with various teachers of different yoga styles. Yoga on nearby Mount Sinai is a regular draw, as are full-moon retreats into the nearby wadis, taking advantage of the silence and space of the Sinai desert. Ras Mohamed is the point where two different water masses are coming together: the salty water from the Gulf of Suez and the less salty water from the much deeper Gulf of Aqaba. As a result of these merging waters there are now more than 1.000 species of tropical fish and more than 170 species of corals as well as a huge number of sponges and gorgonians. Also the Green Turtle and the Hasksbill Turtle can be seen here. Because of its exceptional beauty and its enormous scientific significance, the Egyptian Government has declared this area as a protected area in 1983. It includes marine and terrestrial areas. The peninsula is situated at the most southerly point of Sinai and extends for around 8 km into the Red Sea. The park is surrounded by magnificent fossilized coral reefs that are famous in the whole world for its unique beauty. The highest point is the Shark Observatory from where you receive a fantastic view of the reefs below. Ras Mohammed is home to 85 flower and plant species, 14 types of mammal and an essential staging post for 100’s of bird species, such as terns, herons, gulls and ospreys. Thousands of white storks pass through Ras Mohamed each year, heading south during September/October and back north during April-May. There is even a mangrove forest which is almost unique in Sinai. A well equipped visitor’s centre shows educational films and slideshows about the park. Ras Mohamed is offering fantastic opportunities for diving and snorkelling. Ras Nabq is situated on the coast between Dahab and Sharm el Sheikh. This 600 sq km desert area was declared a conversation area in 1992. It is especially interesting for plant and animal enthusiasts. You find here one of the largest single of Arak Bushes in the Middle East, which are covering the higher dunes of the Wadi Kid. Here you can also find a 4 km long mangrove forest. So-called stalk roots are tightly interwoven, both in and above the water. The roots are able to filter the saline water and salt is excreted via the leaves of the trees. Ras Nabq is the natural habitat for a large variety of plant species. More than 130 plants species can be found, about 85 are unique. Also various animals like gazelles, Nubian ibexes, hyraxes, desert foxes and hyenas have their habitat here. Underwater around Ras Nabq you can find populations of the extremely rare Manatee, also called ‘Sea Cows’. Ras Abu Galum covers an area of about 400 sq km and is situated on the east coast of South Sinai, right between Dahab and Nuweiba. Its spectacular granite mountains are ending abruptly on a narrow coastal plain fronted by rich coral reefs. The high mountains, wadis, fresh water springs, picturesque sand dunes and gravel alluvial fans has been protected since 1993. Not only the fauna and flora is protected, also the habitat of the Bedouin, who still live a life relatively free from influence of tourist. Recent surveys have identified 167 species of desert plants, many of which are not found in either Ras Mohamed or Ras Nabq. As a result, Ras Abu Galum is also home to the largest number of Nubian ibexes, hyraxes, red foxes and striped hyenas. Ten different species of lizards and snakes have also been identified. The coral reef is mostly undisturbed with a high diversity of reef fish, whose richness of its flora and fauna is overwhelming. The reef at Ras Abu Galum supports an active Bedouin artisan fishery. As in other protected areas you can see them standing in the water, fishing. Ain Khudra is located 12 km north for Nuweiba, approx. 8 km away from the main road from Nuweiba to St. Catherine. Tucked away between yellowish sandstone cliffs it is one of Sinai’s most scenic oases. This is an original and pristine Bedouin settlement, reputedly on the original pilgrims’ route from Jordan to Mount Sinai and with links to the early history of St Catherine’ Monastery. On the nearby Rock of Inscriptions, writings and drawings prove that Nabateans, Greeks, Romans, Byzantines and Christians passed through this way. Ain Khudra means ‘green oasis’ which perfectly describes this beautiful oasis, where gushing fresh water springs nourish date palm gardens and guava trees in the seemingly barren desert. Only a few Bedouins are living here with some goats. The oasis is a fairly popular destination for camel and jeep safari’s and day trips to the desert from Dahab and Nuweiba. When approaching from the south you’ll be greeted by a splendid panoramic view of the small oasis glaring brilliantly in the distance below. Ain Kid is a big oasis, surrounded by mountains, containing groves, date palms and a well. The oasis is situated about 15 km west of the road Dahab to Sharm el Sheikh. Next to the oasis there is a marvellous canyon with a spring called Ain Esh Sharia. This spring is only appearing in very rainy seasons. The Blue Desert, which lies western and very close to the monastery of St. Catherine, has an extension of ca. 15 sq km. In 1980, the Belgian artist Jean Berame came to the Sinai Desert and painted many boulders with a UN-blue colour (the colour of peace). It was – with the permission of the late president Anwar el Sadat – meant to symbol the end of the war between Israel and Egypt. The 6 km of painted stones, some of which rise to heights of over 900 m, is a vision in which Berame has used colour to successfully alter the substance of the rocks. At times they appear more like giant balloons, or great gobs of cast-out chewing gum. The stones contrast vividly with the reds, browns, and yellows of the desert, and masterfully compliment Sinai’s deep-blue sky. It is a definitely extraordinary place which is worth visiting when close to St. Catherine. 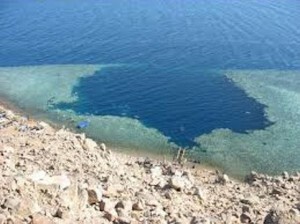 This is the most famous and probably the most beautiful diving spot in all Sinai. It is also known as ´The Canyon´. It lies about 10 km north of Dahab and is only accessible via a 15 minute off-road drive along the beach. It takes its name from the breath-taking crystal clear dark and blue water that has a depth of ca. 80 m. The Blue Hole is 107 m deep with an arch opening onto the reef face at 58 m. This site is considered to be the most dangerous scuba diving site on earth. The Coloured Canyon lies close to the town of Nuweiba and is about 800 m long. The road to the Coloured Canyon through the Wadi Watir snakes through magnificent mountains and bold, rugged rock formations of awe inspiring beauty. They vary from sandstone to limestone, granite and veins of basalt, while the vegetation just exists of some lonely acacias, tamarisk trees, willow trees, sodom apples (which are poisonous) and desert pumpkin. Then, by a cluster of date palms, it turns onto a gravel road for about 15 minutes leading to the summit. The rare rock formations and canyons walls are dramatic and breathtaking. If you walk through this canyon and you look around and above you at the huge walls towering above you, it makes you realize what a geological wonderland you are walking through. In some places, the rocks radiate crystalline colours; in others they have a smooth velvety appearance. The rocks are shaped into stunning formations like roses and waves – an amazing display of nature! Some areas of the canyon reach over sixteen stories in height, providing dramatic effects in light and shadow, and giving the entire location a mysterious and ancient atmosphere. The silence in this canyon is adding a certain oddity. A hike to the Coloured Canyon can be combined with a trip to the Monastery of St. Catherine. Tur lies on the west side of the South Sinai about 100 km north of Sharm el Sheikh. The old harbour was meant to control the shipping trade in the Gulf of Suez. It’s a nice place to discover the simple rustic of life in the Sinai. The history of the city of Tur dates back to the time of the pharaohs. The first inhabitants called it ‘Raithu’, the land of fruit, because there were so many palm trees with dates to be found. In the Bible Tur is called ‘Elim’. Later Tur was named after the nearby mountain, ‘Gebel el Tur’. The old city was built of coral and fossil and you can still find such houses. El Tur is originally a Bedouin village where people from various tribes can be found. Originally the Bedouins from Tur are fishermen and for many this is still a fact. The Bedouins go fishing in the traditional way with small boats, not using any modern fishing techniques, except that their boats now are equipped with an engine. About 5 km from Tur, at the northern point of Wadi Tur, are some hot springs known as Hammam Musa. It is a natural thermal spring tumbling its waters into a number of pools (37 degrees) in the middle of a huge date palm tree grove. The waters of the springs are rich in minerals and are supposed to have healing powers. There is a big dome which covers one of the springs. The tradition holds that these springs have been one of the possible stopping points used by Moses and the Israelites on their journey through Sinai. St. Catherine’ Monastery is an Orthodox monastery at the foot of Mt. Sinai. It’s located about 120 km from Dahab at an altitude of 1500 m in a small, picturesque gorge. It is a region of wilderness made up of granite rock and rugged mountains which, at first glance, seems inaccessible. The Monastery of St. Catherine is one of the oldest Christian monasteries in the world. St. Catherine’ Monastery incorporates the burning bush seen by Moses and contains many valuable icons. Above the monastery is Mt. Sinai, where Moses received the Ten Commandments from God. Because God spoke to Moses in these places, this area is sacred to three world religions: Christianity, Islam and Judaism. St. Catherine’ Monastery is surrounded on all sides by a massive wall 2.5 m wide and 11 m high. This is the wall provided by Emperor Justinian in the 6th century. It is made of huge dressed granite blocks except for the upper sections, which were restored on orders of Napoleon using smaller, undressed stone blocks. Christian symbols, such as crosses and monograms, are carved on the wall in various places. Within its imposing walls rests a citadel like no other, incredibly rich in important religious and historical structures. The monastery contains the chapel of St. Catherine of Alexandria, beautiful artworks, relics and Byzantine mosaics. Among its treasures is a library of ancient manuscripts and icons and a 6th century church reputed to lie directly on the site of the Burning Bush. This monastery is located alongside the Old Port of Tur. It has been a site of monastic habitations from the late 3rd and early 4th century. Greek orthodox monks still live here and it is a spiritual oasis for the Orthodox Christians who live in Egypt. Mt. Sinai (also Gebel Musa or Mountain of Moses) is considered to be that biblical peak. It is the mountain at which the Ten Commandments were given to Moses by God, according to the Book of Exodus. It has also religious significance to the Islam as the place where Mohammed’s horse, Boraq, ascended to heaven. The 2285 m high mountain has 3750 steps hewn out of stone by monks of St. Catherine’ Monastery. It takes about 3 hours to climb the stairways to the peak, following the Path of Moses. Ancient chapels and structures honouring saints and the Virgin Mary appear all along the main route, including a stone-hewn arch where, long ago, a monk once sat and heard confession from the pilgrims. Nearing the summit, one encounters the natural amphitheatre where the 70 wise men waited while God spoke with Moses, then finally a small chapel and mosque at the top. 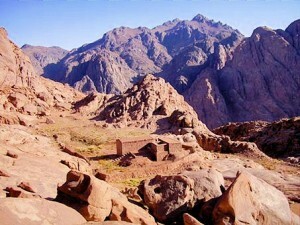 This ancient place can be reached on the way from Dahab to St. Catherine´ Monastery. These mysterious prehistoric structures can be dated back to the Chalcolithic Period (Copper Stone Age), which was about 4000-3150 BCE. Each tomb is constructed with dry-wall stone in a circular way and has its door facing west. They are – especially for their age – still very well preserved. Nawamis are constructed of sandstone, about 2-2.5 m high and 3-6 m in diameter, and have openings facing west. Archaeologists have found coloured beads, bracelets out of shells, tools and bones inside the tombs, which they believe to have been funeral offerings. About 7 km south of Taba and 250 m offshore lies Pharaoh’ Island (Gezirat Faraun or Coral Island), a tiny island in turquoise waters. The so-called Pharaoh’s Island however has nothing to do with any pharaoh, rather it was the farthest point of their expansion. The island is dominated by the Crusaders fortress, which originally was built on the northern hill by Baldwin 1, the King of Jerusalem. From the top of the fortress, one can see four countries: Egypt, Israel, Jordan and Saudi Arabia. The building of the fortress apparently began around 1116 AD. Situated on the centre of a huge trade route between the Far East and Europe, while in Crusaders hands, it was used to collect taxes on Arab merchants. Sometimes it was also used to attack Arab shipping, while at the same time protecting pilgrims travelling between Jerusalem and the Monastery of St. Catherine. However, around 1170 the fortification was captured by Salah ad-Din. He was the one who expanded the fortress considerably. The fortress has many small rooms some with arched doorways and other without. These rooms included sleeping quarters for the troops, bath houses and kitchens with huge ovens. There are towers to house carrier pigeons, which were used for relaying messages in the Middle Ages and circular towers for archers. The fortress itself has been restored in modern times. The two southern hills have Byzantine ruins. The Coral Island Harbour was obviously a busy port at one time, as shown by the large buildings near harbour and a slipway now under the water on harbour’s northeast edge. A casemate wall and its nine towers going around perimeter may date to Solomon’s time, though some scholars date them to the Byzantine Age. Most of the pottery found on the sea bottom is from the late Roman and Byzantine periods. The reefs north of the island offers excellent opportunities for diving or snorkelling, but one should be careful doing this alone as currents are reportedly strong around here. This beautiful granite wadi with an oasis and several Bedouin gardens, just 20 minutes from the coast at Dahab is great for hiking and rock climbing. The climbing that exists is suitable to every level of ability. There is a little something for everyone. Rocks consist of mostly hard sandstone or granite in various colours. The sun brings a wide spectrum of change. Clear quartz turns to white, black basalt to dark purple and beige limestone to an array of pinks. Although smaller than the Coloured Canyon, the White Canyon is still a very impressive sight. The White Canyon, created through mountains of sandstone and limestone, earned well its name. Most of the massive and breathtaking cliffs are just as white as snow. These deep canyons have been forming over thousands of years due to water and wind erosion. As you exit the Canyon, the Ain Khudra oasis will appear in sight. If you enjoy observing dramatic geological landscape, this walk is definitely worth the effort.